As the United States was gearing up for the space race, there were several development tracks that were underway in the mid-1950s. President Eisenhower wanted America's first satellite to go up on a civilian launch vehicle, which at the time was the Vanguard. Though Vanguard was having reliability problems, the Soviets launched Sputnik into orbit, prompting the US to attempt a Vanguard launch. The Vanguard made it four feet into the air before crashing back onto the pad while the satellite was ejected into nearby bushes. The media nicknamed the attempt as 'kaputnik'. Werner von Braun wanted to get into space first and pushed to use the PGM-11 Redstone as the launch vehicle. At the time, the Redstone was the US Army's short-range ballistic missile, but replacing the bulky nuclear payload with a smaller satellite would allow the Redstone to achieve orbital velocity. After the Vanguard launch failure, von Braun was given the approval to use the Redstone. The resulting modified launch vehicle was called Juno I which successfully carried the Explorer I into orbit. Several years later, Australia received a surplus Redstone launch vehicle which was modified to use the Sparta/WRESAT and made Australia the third nation to launch an orbital satellite from their own territory. 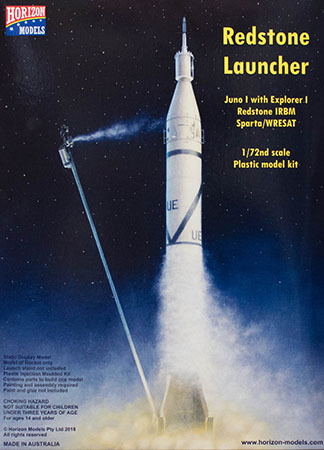 Horizon Models has returned with its fifth kit in its spacraft series, the Redstone Launcher. 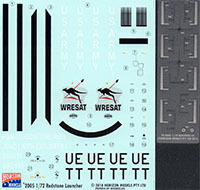 This kit provides three options for your launch gallery: the PGM-1 Redstone missile, Juno I launch vehicle, and the Sparta/WRESAT launch vehicle. The instructions are well-illustrated and provide clear directions to replicate any of the three subjects. Decals are printed by Microscale. The only problem with this kit is that you must choose a subject. I may have to acquire two more so that I can build all three!